Solid surface resin molds easily into an array of fabulous designer forms to create daring new soakers for today's modern baths. Barclay's superior blend of polyester/aluminum tri-hydrate produces durable, easy care tubs that are now available with either a silky matte or glossy finish. These sleek contemporary tubs pair perfectly with a freestanding tub filler. 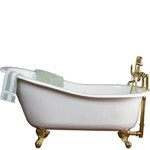 Indulge in the elegance of a soaking tub from Barclay. You don't have to wait for specials, search for a coupon, or cross your fingers and hope for a good deal. Our freestanding tubs are always on sale. We go to our best sale price and offer that to you right at the start. You will see that when the price is listed as "sale price". 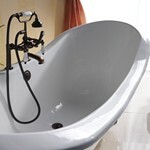 * We will ship our soaking tubs anywhere in the Contiguous US free of charge. Resin soaker tubs and sinks are cast in a joint-free mold using a polyester-aluminum trihydrate blend material that hardens to a solid surface. Resin’s non-porous surface naturally resists stains, scratches and discoloring. Sometimes referred to as "man-made stone", its extremely durable. This versatile material also allows more freedom of design since it can be cast into countless shapes and forms. Clean water will remove most dirt from your resin tub. Use only mild cleansers that are safe for painted surfaces when necessary. Do not use abrasives, acids or ammonia. Wipe dry after each use to retain original beauty. using #800 grit sandpaper until scratch disappears. Follow with #1200 sandpaper to smooth area. Dry with a soft towel and finish by polishing with automobile polish.